Shenzhen vvsJewel Gold Diamond Jewelry Factory Which Focus On Luxury Branded 18K Gold & Diamond Jewelry was founded in 2011. vvsJewel Gold Diamond Jewelry Factory for Luxury Fine Jewelry 18K Gold Jewelry Diamond Jewelry Worldwide Shipping to Your Door. Enterprise mission: Contribute to industry development. Create value for the social harmony. Provide customers with quality service. Provide a good platform for employees. Enterprise idea: With human foundation, continued innovation, integrity management, sincere service. Enterprise spirit: Unit and progress, the pursuit of excellence. Business requirements: quality assurance, service sincerity, credibility first. Business philosophy: Respect our customers, base on credibility, goal of best quality. 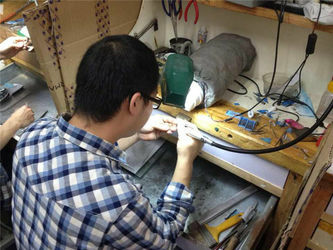 Sleepal Jewelry belongs to the yourger generation, young people oriented, consumers mainly locate in the modern urban men and women, at the same time according to different consumption level high, medium and low end crowd of requirements in terms of product development, on the premise of consumer interests constantly optimize the product structure, provide the market with the most fashionable and high quality jewelry. 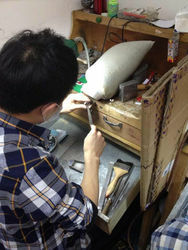 "Jixiang Ruyi, Jinru Mangtang" is the core of Sleepal Jewelry brand concept. With the media of jewelry, based on the traditional culture, using the modern mode of operation to build bridge with consumers. Making good fortune as one wish, wishes everybody every family of prosperity. Found and appreciated around the world, colorful and sparkling cut gemstones share a universal appeal. The inherent allure of gemstone jewelry, with its myriad color and style combinations, is its ability to create, capture or reflect personal style. While most buyers likely choose gemstones for their beauty and to represent their feelings toward another, others choose gemstones for what they consider to be their therapeutic benefits, symbolism, or representation of wealth or position. Featuring gemstones in jewelry dates back thousands and thousands of years. Gemstones and gemstone jewelry have a long and interesting history. The story of the "Breastplate of Aaron" chronicles gemstone use for tribal and spiritual purposes. Examples of gemstone use in ancient Christian, Egyptian, Roman, Greek and other civilizations is widespread – recognizing gemstones for their mystical properties or their representation of wealth, cultural beliefs or religious affiliations. In modern times, the practice of assigning meaning to stones associated to astrology, more specifically as birthstone jewelry, was first seen in 15th century Poland. In the early 1900s the connection of specific stones to birth months was formalized in the United States. Though criticized by gemstone purists as a commercially motivated effort, people worldwide embrace the concept of birthstones and appreciate the ability to place deeper meaning in the gemstone jewelry they wear. As you search for the right gemstone jewelry, the folklore, myths, characteristics, or properties associated with each gem may offer you or its wearer greater interest, meaning and enjoyment. The distinction between precious and semi-precious gemstones probably most reflects the perceived availability of the respective stones in historic times. Stemming from the ancient Greeks, the traditional differentiation of precious and semi-precious gemstones was rarity: diamond, ruby, sapphire and emerald were considered precious, while all other gemstones were considered semi-precious. In modern times, the terms in a commercial context are less likely, due to the significant range of quality, availability, size and cost of all gemstones in today's marketplace. Resembling the beauty of more costly genuine gemstones, lab-created synthetic and simulated stones have been popular in jewelry for many hears. It is important to know, though, that the value of these imitations varies greatly, and their everlasting beauty depends on the kind of gem they are. Lab-created synthetic gemstones are typically similar in composition to their naturally occurring mineral counterparts, but they are grown in a controlled laboratory environment to yield a similar result. 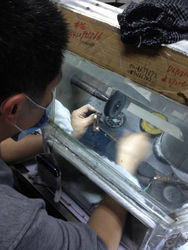 Sleepal chooses high-quality laboratory-created gemstones for their affordability, beauty, excellent appearance and value. All synthetic and simulated stones will be clearly indicated in Sleepal product descriptions. While most may consider gemstone jewelry as attractive adornment, others believe gemstones possess special meaning and healing effects. Used in a form of therapy, gemstone energy medicine uses the unique properties inherent in each type of gemstone to help focus the body's own healing powers. Authorities on the subject state that to obtain the greatest benefit a gemstone must be of high quality and the proper shape, and that gemstone necklaces place the stone in a location that will benefit the entire body. Amethyst, known for its spiritual qualities and used for general healing and meditation. Sleeping with an amethyst beneath your pillow may promote intuitive dreams and inspired thought. Diamond, considered a master healer. An extremely powerful stone, a diamond is thought to promote emotional strength and love. Emerald, a calming stone, is said to improve intellect and memory. Thought to have wide-ranging positive properties - including relieving insomnia - emerald acts as emotional stabilizer to assist in the release of emotionally-based trauma. Ruby, thought to increase energy and divine creativity. In addition, ruby is said to alleviate worry, lift spirits, and improve confidence, spiritual wisdom, and courage. Sapphire, often sought for its calming effect on those prone to nervousness. Considered a stone of friendship and love, sapphire attracts good influences, and gives its wearer devotion, faith, imagination and peace of mind. Gemstones are available in a wide range of varieties and are incorporated into many forms of jewelry including gemstone earrings, necklaces and rings. Color – The color of the gemstone affects its value and how it shows in the jewelry. Generally clear, medium-tone, intense and saturated colors are the most preferred. Avoid stones with color that is too dark or muddled. The brighter and more vivid the color, the better. Clarity – After color, gemstone clarity is the next most important factor. Clear, transparent gemstones with no visible flaws (inclusions) are the most valued. Clarity can be difficult to judge, but if flaws aren't visible in the face-up position, then they rarely matter. Some gemstone varieties, such as emerald and red tourmaline, are rarely seen without inclusions. It is important to consider clarity within the gemstone variety, and not against other gemstones. Carat – Colored gemstones are sold by weight, not by size, and prices are calculated per carat. It's important to recognize that some gems are denser than others, so similarly sized stones of different varieties may differ greatly in cost. In addition, larger stones of some varieties can be quite rare and much more expensive – such as ruby, emerald, sapphire and tourmaline. When searching for the perfect piece of gemstone jewelry, buyers often place too much concentration on the item itself without considering how the jewelry will be worn. Properly pairing jewelry with attire, or for a particular use or occasion is critical in ensuring the jewelry will be worn and enjoyed. For example, if you're buying a gift and you choose an ornate gemstone necklace but the intended wearer is most often in a formal business environment, a more subtle bracelet or ring may be a better choice if you want her to wear and enjoy her jewelry often. Also consider the hardness of the gemstone, the style of setting and how the gemstones are set, how often the jewelry piece will be worn, and what the wearer really likes. The most beautiful gemstone jewelry may never be worn if your loved one does not like the look or color of her birthstone, for example. While there is a great deal of information available about gemstone jewelry in books and online, ask questions of your jeweler. Regardless of the amount of information gathered during the purchase process, there always seems to be one more fact that can impact your final decision. Asking questions will help you find the perfect piece of gemstone jewelry, sure to be appreciated for years to come. Diamond jewelry is among the most popular forms of jewelry. Commonly associated with romance, jewelry featuring diamonds is appreciated for its brilliance, style and meaning. Despite diamond jewelry's popularity and constant presence in our society, picking the right piece is not as simple as what many might assume. Confronted with the nuances of contemporary styles and budgeting, not to mention personal tastes, it's no wonder how diamond jewelry shoppers can feel overwhelmed when trying to find that perfect set of wedding bands, a ring or bracelet. As a result, Sleepal has prepared this Diamond Jewelry Buyers Guide to give you a sound understanding of what to look for when making a purchase. After all, buying diamond jewelry should be enjoyable! To maximize the pleasure of your purchasing experience, it's helpful to develop a broad understanding of diamond jewelry, which includes a brief history and the basic questions you should answer before beginning your shopping trip. Afterward let's look more closely at diamonds themselves with a review on the 4 Cs of diamond quality and conclude with a diamond jewelry glossary that will educate you on all the terms you need to know when researching your purchase. Diamond jewelry has charmed generations of people across the world for centuries. Traditionally only available to the rich and famous, diamond jewelry has become an aspirational item that is as important for the message it conveys as its brilliant appearance. The event that awakened the world's appreciation of diamond jewelry was the 15th century wedding of Maxmilla of Austria to Mary of Burgundy, where the groom gave the bride a brilliant diamond engagement ring . Until that time, the arduous processes of mining, cutting and polishing diamonds followed by crafting diamond jewelry was not actively pursued, but Maximilla started a trend that continues to grow in popularity today. Although owning diamond jewelry has historically made an inference about the class and social stature of the wearer, today it suggests emotional themes of commitment, durability and beauty commonly associated with romantic relationships. Understandably, when shopping for diamond jewelry, it's important to make a sound choice. Diamond jewelry is available in a variety of forms and it's important to understand the occasion to select an appropriate piece of jewelry. A diamond engagement ring, wedding band set or some other form of bridal jewelry is appropriate for engagements and weddings, but for little else. For those that appreciate the elegant look and brilliance of diamond jewelry, a pendant, a bracelet or a 3 stone diamond ring often makes an excellent gift. Lastly, consideration should be given to when and how the jewelry will be worn to ensure that any piece of diamond jewelry can be worn in the way in which it was intended. Selecting a budget for buying diamond jewelry is deceptively easy; simply evaluate your finances before starting the shopping process to determine the amount that can be comfortably spent. 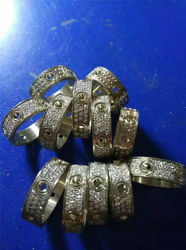 Many allow substantial purchases like diamond wedding bands to cloud their judgment, which creates regret. Frequently buyers start their search without a budget, which forces them into making a difficult decision when confronted with a beautiful piece of diamond jewelry that captures their imagination. Having an established budget in mind before your first shopping trip will prevent anxiety and make the entire experience more enjoyable. What Types of Diamond Jewelry Do They Currently Have? What Would Look Good With Their Current Wardrobe? Are There Friends and Family Who Can Offer Suggestions? Arming yourself with details about the preferred style and any related characteristics will give you necessary information to save time and effort when looking for the perfect piece of diamond jewelry. Although most commonly associated with the purchase of engagement rings jewelry size is important regardless of the type. In fact, there is no form of jewelry that shouldn't be considered for size. Rings require an exact measurement and should be taken earlier in the day before any swelling or irritation of the fingers. 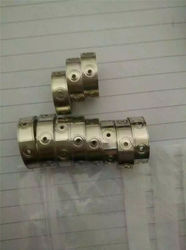 Bracelets require obtaining the diameter of the wrist and adding ¾' to 1'. Sizing necklaces can be much more problematic; there are a variety of styles not to mention personal preferences, so when in doubt confirm that sizing can be changed if necessary. Lastly earring length should be considered, especially when considering longer types like chandeliers and hoops. The key to assessing the value of diamond jewelry is understanding the principles of diamond valuation itself. Commonly known as the 4 Cs, the grading scale focuses on the comparison of a diamond to a comparably sized perfect example. American Gem Society (AGS): An educational organization for gemological studies. The AGS Labs were created primarily to develop and encourage universally-authorized criteria for grading cut. Blemish: A clarity attribute that transpires on the surface of a diamond. Though some blemishes are natural to the original rough diamond, most are the result of the environment the diamond has experienced since it was unearthed. Brilliance: The brightness that appears to come from the heart of a diamond. With a level that is unique to diamonds, other gemstones posses lesser levels and don't have the ability to equal the extent of diamond's light-reflecting power. Brilliance is produced primarily when light makes its way into the table, reaches the pavilion facets, and is then reflected back out through the table, where the light is most visible to your eye. Brilliant Cut: One of three variations of faceting layouts. In this type of arrangement, all facets appear to radiate out from the center of the diamond toward its external edges. It's called a brilliant cut because it is designed to maximize brilliance. There are a number of brilliant cuts like round diamonds, ovals, radiants, princesses and more. Carat: The unit of weight by which a diamond is measured. One carat equals 200 milligrams, or 0.2 grams originating from the use of carob beans to measure the weight of gemstones. Carbon Spots: This term refers to imperfections called included crystals that have a dark appearance, rather than a white or transparent appearance, when viewed under a microscope. Clouds: A grouping of a number of tiny inclusions that is too small to be distinguishable from one another, even under magnification. Not visible by the naked eye, they look like a soft, transparent cloud under a microscope. Color Grading: A system of grading diamond color based on their colorlessness (for white diamonds) or their spectral hue, depth of color and purity of color (for fancy color diamonds). Crown angle: The angle at which a diamond's bezel facets intersect the girdle plane. This gentle slope of the facets that surround the table is what helps to create the dispersion, or fire, in a diamond. Culet: A very small flat facet that diamond cutters commonly add at the base of a diamond's pavilion. Its purpose is to protect the tip of the pavilion from being chipped or damaged. Depth: The height of a diamond from the culet to the table. Depth Percentage: On a diamond grading report, you will see two different measurements of the diamond's depth-the actual depth in millimeters (under "measurements" at the top of the report) and the depth percentage, which expresses how deep the diamond is in comparison to how wide it is. This depth percentage of a diamond is important to its brilliance and value; where that depth lies can be equally important. Diamond: A crystal made up of 99.95% pure carbon atoms arranged in an isometric crystal arrangement. Diamond Cutting: The method by which a rough diamond that has been mined from the earth and shaped into a finished, faceted stone. Diamond Gauge: An instrument used to measure a diamond's length, width and depth in millimeters. Dispersion: Also known as "fire" it the manner in which the light is broken and reflected. Components of light are broken into spectral colors (for example, red, blue and green and appears as a play of small flashes of color across the surface of the diamond as it is tilted. Emerald Cut: A square or rectangular-shaped diamond with cut corners. Eye-Clean: A jewelry industry term to describe a diamond with no blemishes or inclusions that are visible to the naked eye. Facet: The smooth, flat faces on the surface of a diamond. They allow light to both enter a diamond and reflect off its surface at different angles, creating the wonderful play of color and light for which diamonds are famous. Feathers: These are small fractures in a diamond. Finish: This term refers to the qualities imparted to a diamond by the skill of the diamond cutter. The term "finish" covers every aspect of a diamond's appearance that is not a result of the diamond's inherent nature when it comes out of the ground. Fluorescence: An effect that is seen in some gem-quality diamonds when they are exposed to long-wave ultraviolet light. Gemological Institute of America (GIA): Founded in 1931 by Roger Shipley, this non- profit organization upholds the standards for grading diamonds and is one of the most-respected and well-regarded gemological laboratories in the world. Girdle: The outer edge, or outline, of the diamond's shape. Laser-Drill Holes: One of the few man-made inclusions that can occur inside a diamond. An intentionally created inclusion can actually raise its clarity grade. Length-to-Width Ratio: A comparison of how much longer a diamond is than it is wide. It is used to analyze the outline of fancy shapes only; it is never applied to round diamonds. Naturals: Small parts of the original rough diamond's surface which are left on the polished diamond, frequently on or near the girdle. Pavé: A style of jewelry setting in which numerous small diamonds are mounted close together to create a glistening diamond crust that covers the whole piece of jewelry and obscures the metal under it. Polish: Refers to any blemishes on the surface of the diamond which are not significant enough to affect the clarity grade of the diamond. Ratio: A comparison of how much longer a diamond is than it is wide. Single-Cut: A very small round diamond with only 16 or 17 facets, instead of the normal 57 or 58 facets of a full cut round brilliant. Step Cut: One of three styles of faceting arrangements. Symmetry: Refers to variations in a diamond's symmetry. The small variations can include misalignment of facets or facets that fail to point correctly to the girdle (this misalignment is completely undetectable to the naked eye). Symmetry is regarded as a quality indicator of a diamond's cut; it is graded as Ideal, Excellent, Very Good, Good, Fair or Poor. Table percentage: The value which represents how the diameter of the table facet compares to the diameter of the entire diamond. Birthstone jewelry is very popular today and dates back to ancient history. Throughout the ages people have had the strong desire to adorn themselves with items not only of beauty, but also meaning and birthstone jewelry is just one example. These meanings can manifest themselves in any number of ways including personal meaning, belief that birthstones posses medicinal affects or several others. When searching for a piece of birthstone jewelry, it can be helpful and interesting to understand the history behind birthstone jewelry, the beliefs that some hold surrounding it and some of the most popular forms of this type of jewelry. Afterward, you'll be well positioned to enjoy your birthstone jewelry buying experience and find that perfect ring, necklace or bracelet. Since ancient times, people from across the world have valued beautiful stones and minerals, incorporating them into their everyday lives. Civilizations including the Greeks, Romans, Egyptians, Persians, Incas and Aztecs strongly believed that these gemstones possess many attributes, curative powers and even the power to convey the soul to peace in the afterlife. While the value of gemstones is consistent across ancient history, the story of their integration as birthstones is less clear. Biblical Birthstones were mentioned in the Bible's Old Testament suggesting that the twelve birthstones can be traced to the twelve tribes of Israel. Zodiac Birthstones have evolved over thousands of years as astrologers have assigned gems of certain colors to the twelve signs of the zodiac to help people influence the planets in their favor. Modern Birthstones did not exist until 1912 when the Jewelers of American developed a list of birthstones in an effort to settle on a standardized list of birthstones. The Breastplate of Aaron: The First Piece of Birthstone Jewelry? Whether you believe that birthstones possess meaning, beneficial qualities or not, birthstone jewelry is as ancient as the stones it uses. Like the history of birthstones, the origination of birthstone jewelry is vague, however one of the first descriptions of birthstone jewelry was seen in the Bible. The Breastplate of Aaron was said to be a religious garment worn by Aaron during religious ceremonies. The item was said to have twelve gemstones embedded within it, each representing one of the Israeli tribes. Regardless if this Old Testament story is true, presently gemstones of all sorts can be found in birthstone jewelry of all types with meanings as varied as the people that wear it. Necklaces continue to be popular among the many forms of birthstone jewelry available today for a number of reasons. First, the color and brilliance of the gemstone creates an eye catching appearance that many desire. For those that believe that birthstones possess medicinal properties, it's said that wearing the stone close to the center of the body maximizes its positive effects. Finally, a necklace is a favorite clothing accent and can often be combined with other pieces of birthstone jewelry to create an attractive appearance. Rings are a popular form of birthstone jewelry because they are available in a wide range of styles, colors and finishes. 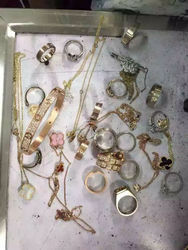 Whether using gold, silver, platinum or some other metal, jewelers can get more creative with rings versus some other forms of birthstone jewelry, since the amounts of precious metal are small and less expensive as a result. Therefore an interesting and truly unique birthstone ring may be less expensive that comparable forms of jewelry. Bracelets continue to be a favorite form of birthstone jewelry, especially charm bracelets. Many enjoy giving the gift of a birthstone charm bracelet with the goal of giving the recipient additional gemstone charms during future occasions. Although each of these items is popular by itself, matching birthstone jewelry sets are also extremely popular. Often two of the above components, the recipient can use the different pieces in a number of ways. Birthday - Obvious or not, giving a gift of birthstone jewelry for one's birthday makes the greatest amount of sense. Anniversary – Whether it's a wedding or some other significant milestone, an anniversary is a good opportunity to give a piece of birthstone jewelry. Graduation – As a recognition of achievement and wish for future success, a birthstone ring or necklace is often among the most popular gifts. Clearly, birthstone jewelry continues to be a favorite for a wide range of reasons. Not only is it attractive, but birthstone jewelry offers greater meaning as a form of personalized jewelry while offering the potential of positive mental and physical effects. If you're searching for a gift for someone special, consider Sleepal birthstone jewelry.